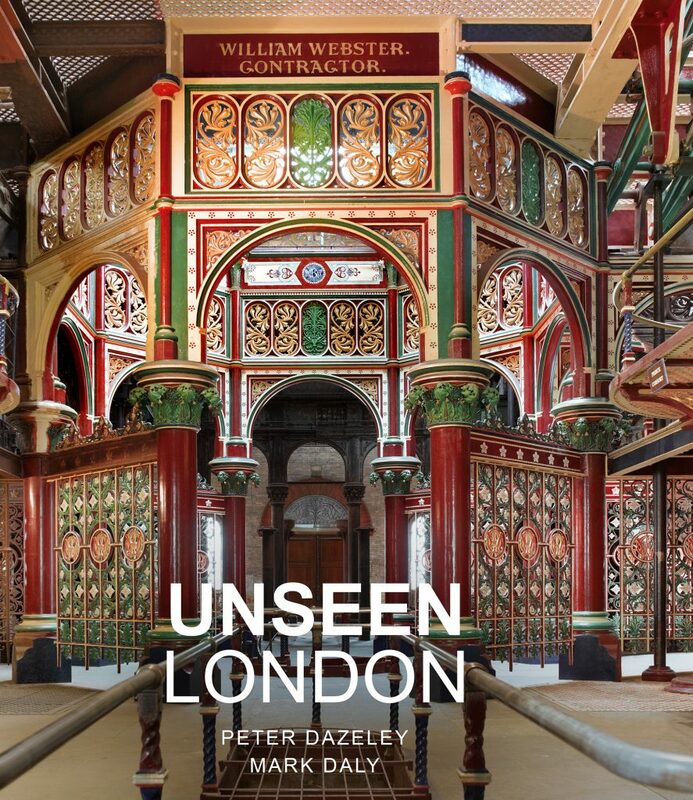 Unseen London was the first London book by photographer Peter Dazeley (and writer Mark Daly). First published in 2014, and revised in 2017, it looks at over fifty buildings that are mostly not open to the public giving us the chance to see behind closed doors. It all started when Peter Dazeley got the opportunity to take photographs at the dilapidated Battersea Power Station. 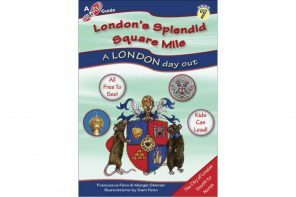 It spurred him on to ‘record hidden London’ for future generations. It took four years to access and photograph the locations in this book. Not all are derelict though, many are still in regular use. The choice of buildings are not the usual suspects seen in ‘hidden London’ books as this includes the cooper’s shop of a south London brewery and a drained reservoir in north London. Many places I have heard of but some were new to me (and I’ve been writing about London for over ten years). Who hasn’t wondered what goes on behind closed doors? We see the imposing black front door of 10 Downing Street, the Prime Minister’s residence, on the news most days but we rarely get to see the interior. The first image in the book is the door of 10 Downing Street. But look again as it’s open and the photographer is inside. Read on and you get to see more photos from this famous address. 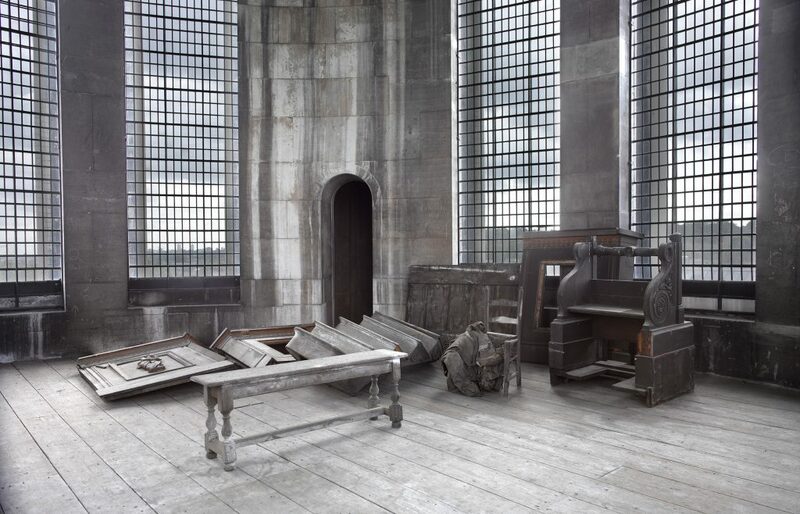 If a building is one that’s open to the public, such as the Old Royal Naval College in Greenwich, Dazeley has been able to show us parts we didn’t even know we wanted to see such as the inside of the clock tower of the Queen Mary Building (amazing muted grey tones in the image), or a collection of carved stone heads intended to decorate the Painted Hall but now stored in an undercroft. 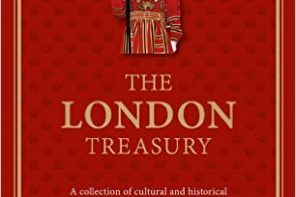 Again, as with Dazeley’s other London books, this is a heavyweight coffee table-sized book so you could leave it out for occasional flicking through. But if you did, you would be missing out. Sometimes a building receives just a two-page spread and sometimes it offers many more pages for a more in-depth feature. 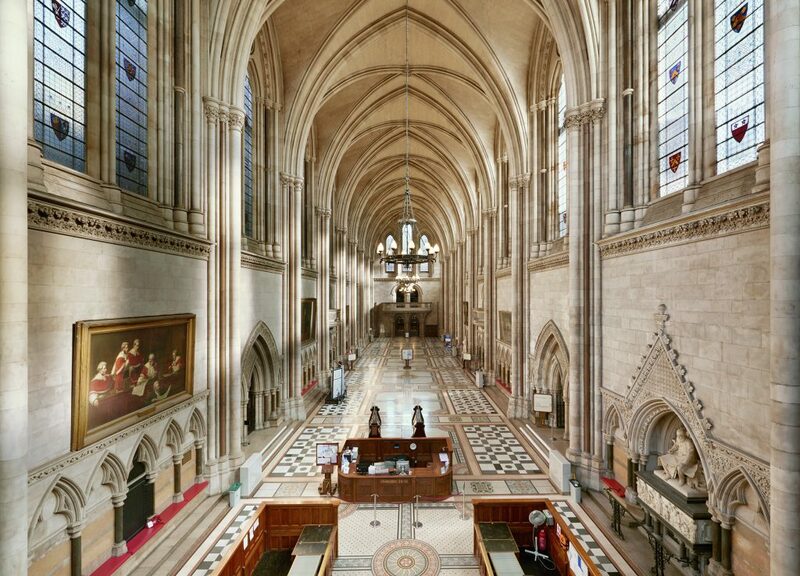 Sometimes places are shown together, such as The Supreme Court and Royal Courts of Justice, even though they are at different locations. Interestingly though, both look like religious buildings both inside and out. But it’s not only a photography book as, just as with his other titles, each building or location has well-researched history and facts that make you want to share snippets with friends as you read. You could treat this book as a magical insight into places you may never get to see. Or you could use it to build your ultimate London bucket list. You could read it as a fantasy London travel guide and dream of being allowed inside these buildings. Or you could just marvel at the stunning photographs and know that this may be closest you get to these obscure locations. It doesn’t matter if you read it from cover to cover or turn to a random page as there’s going to be something to impress you. The locations are grouped together by a common theme. Hidden Levers includes behind the scenes views of the Thames Barrier. (Did you know the metal cladding is maintenance free and has never needed cleaning?) And the images of Crossness Pumping Station looks more like a cathedral than a sewage treatment works. It’s no surprise this made it onto the cover of the 2017 edition of the book (see above). 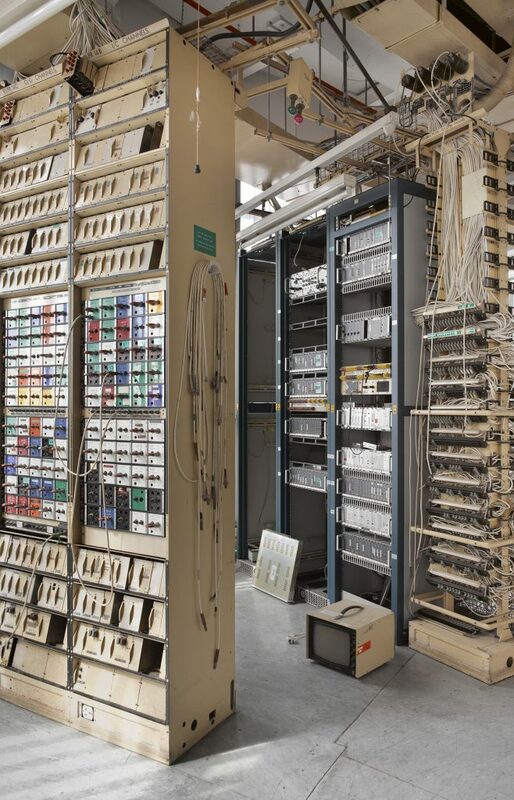 I really enjoyed the opportunity to look inside buildings like the iconic BT Tower. And places that have been rarely seen by anyone such as Kidderpore Reservoir in Hampstead. The Victorian brick arches were concealed below water for fifty years but for a few months in 2003/4 the reservoir was drained, the roof removed and this structure was exposed. 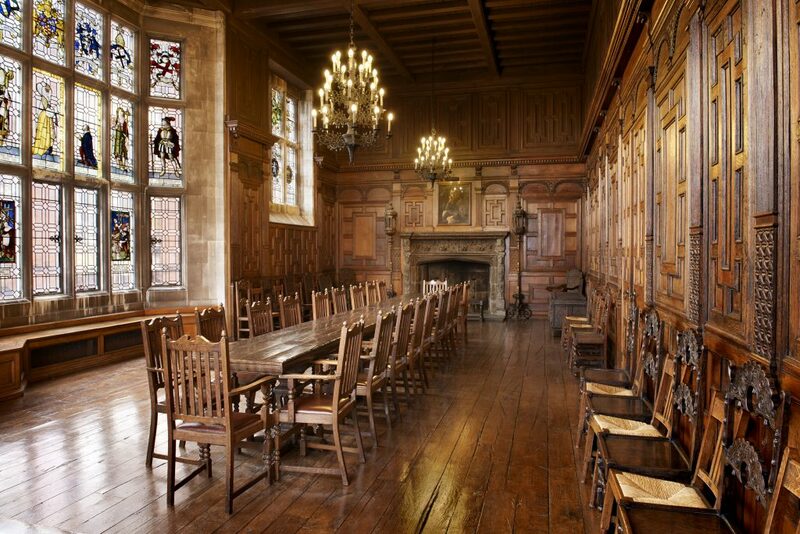 Law and Order includes County Hall Chambers which can, at the time of writing, be seen as the venue for Witness for the Prosecution. From reading I discovered that the chairman’s seat is reputedly made from black oak from a tree hewn at Viller’s Street near Embankment tube station across the river. Seeing the photographs of the Italianate-style Foreign and Commonwealth Office you could think this was in Milan, especially in The Durbar Court. This is definitely one to put on your Open House London wish list as it is usually open to the public for that one weekend each year. As well as the look inside ‘Big Ben’, the book includes the Whitechapel Bell Foundry where the bell was made. Sadly, the Foundry closed in May 2017 so I expect that will be considered in the next revised edition. The book reminded me you can take a tour of Harrow School (something I keep meaning to do) where eight British Prime Ministers were educated. And yes, it looks like Hogwarts. But you can’t otherwise see inside Bow Street Magistrates’ Court as it is just a closed door on Drury Lane to most of us. 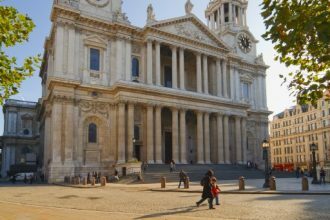 Some of the names held here include Victorian poet and playwright Oscar Wilde, leading suffragette Emmeline Pankhurst, footballer George Best, East End gangsters The Krays and Martin Luther King’s assassin (James Earl Ray). And while you can watch a case at the Old Bailey you would be very unfortunate to see ‘Dead Man’s Walk’, a legacy of old Newgate Prison. This is the route a condemned prisoner would follow from the cell to the gallows. The archways become progressively narrower, designed to focus the mind: you are going one way and one way only. Army and Navy gets us an intriguing look inside the former Naval and Military In and Out Club on Piccadilly, and the Cabinet War Room in north London that few know about (although I have visited there). And in The Fourth Estate section we get to see inside Abbey Road Studios and the, now gone, BBC television studios in White City. Royal London has photos of Hampton Court Palace that are simply better than actually being there. A view of the rooftops and the chapel look stunning even before you get the truly ‘unseen’ London view from behind the astronomical clock, usually only seen from the ground in Clock Court. At the Tower of London there are more amazing photos of unseen areas such as behind the Byward Tower portcullis, the oldest in Britain. And even a possible sign of sorcery carved into a wall. And from places we can visit most days, such as The Banqueting House, Dazeley can show us the view from the balcony, and from the roof void holding the Rubens paintings on the ceiling. Somewhere I had never heard of, but is a wonderful find, is 33 Portland Place, near Oxford Circus, that was used as a filming location for the 2010 film The King’s Speech. Body and Soul features a Bayswater synagogue and the St Sophia’s Greek Orthodox Cathedral which I had to look up and found it is also in Bayswater. I was aware of Boris Anrep mosaics in the National Gallery, and had heard about his mosaics at Westminster Cathedral and the Bank of England, but I didn’t know about these ones. 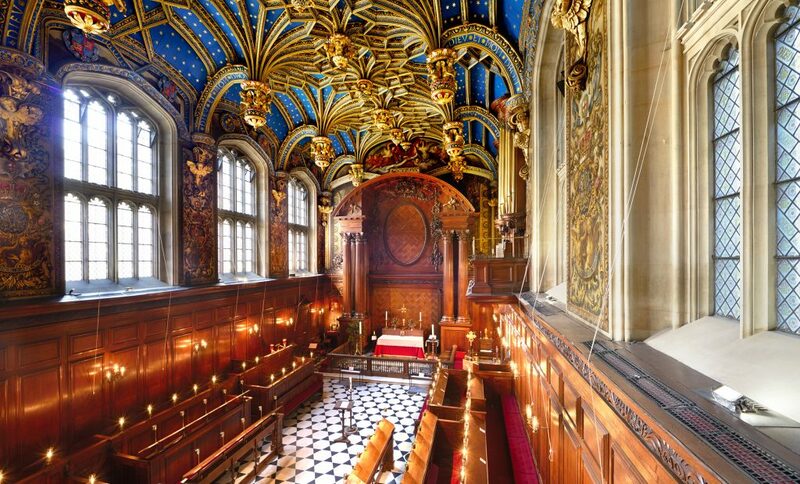 St Christopher’s Chapel at Great Ormond Street Hospital is also stunning and not somewhere I would think to visit. The photos of Freemasons’ Hall are terrific and back to the ‘better than actually being there’ category, in my opinion. But that doesn’t mean you shouldn’t visit as there are up to five free guided tours each day, six days a week. Body and Soul also includes sporting venues and while I have been on a tour of Lord’s Cricket Ground I didn’t get to see the surprisingly photogenic gentlemen’s lavatories in the pavilion basement. Who knew the symmetry of walls lined with urinals could be so interesting? For The Square Mile, Peter Dazeley got in to photograph the old Midland Bank in the City of London, designed by Edward Luytens, before it reopened as a luxury ‘Soho House’ hotel in 2017. (The book notes that the photos were taken in 2014.) So the images are more ‘raw’ than the highly polished Ned Hotel now appears for guests. 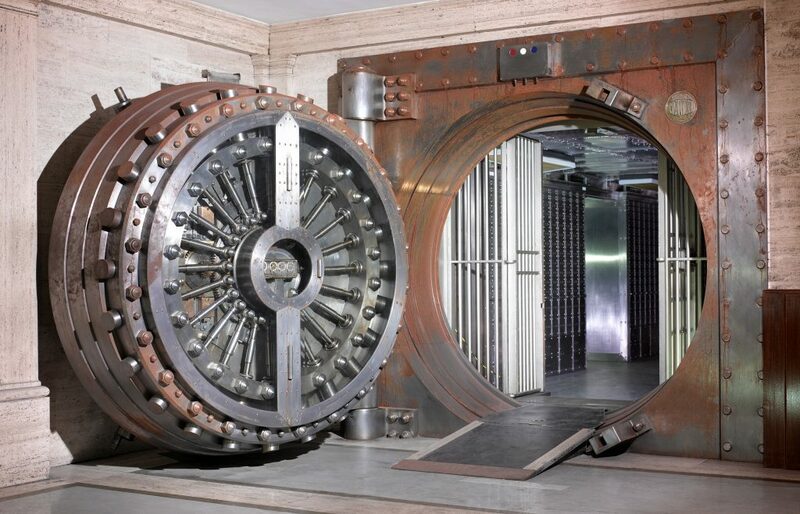 The safe deposit entrance with its 25-ton vault door was still rusty. And who knows if the cabinet for the storage of directors’ top hats and canes is still outside the old boardroom. I do hope so. Another place that Dazeley got to see and record for us before it’s transformation is The Old War Office as it is due to be a hotel by 2020. I didn’t know about the wind director indicator in the Court Room at the Bank of England. It’s a replica of the 1805 indicator, driven by a shaft from a weathervane on the roof which once helped inform the directors of the shipping arrivals. A strong wind from the east indicated that ships were approaching London and that the Bank should prepare money for increased levels of trading in the City. And even while I have visited the Guildhall’s Great Hall, I have never seen the view from the balcony level. This is a wonderful collection of buildings and a chance to study the parts we are unlikely to ever see. Sometimes it’s faded grandeur and sometimes it’s somewhere old but very much still in use. Unseen London doesn’t include addresses and this discrepancy was dealt by in his next book as London Uncovered has excellent contact information for each location. While we can’t visit many of these places this is an excellent book for anyone curious about what lies behind closed doors. And the photography is simply outstanding. Unseen London is an absolute delight to have in my London book collection. The book is available for HALF-PRICE from Amazon at the moment. 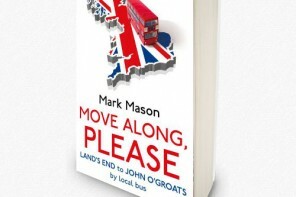 Also available from all good bookshops.